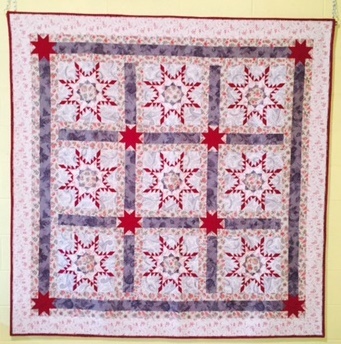 I dream of a quilt studio in the woods overlooking a lake or stream, watching birds and wildlife outside my window as music plays quietly over an expensive Bose stereo system. I can stitch away the day with no other responsibilities except to be a wonderful wife and grandma. That’s not likely to happen any time soon, so I’m content begrudgingly working in my unfinished basement with the beautiful yellow cement block walls. But a design wall would make all the difference, so the Woodworker, being the fabulous husband that he is, helped make THAT dream a reality for Mother’s Day. If you’ve wondered how to create your own design wall, here’s how we did it, in pictures. We started by buying a sheet of 1.5 inch thick Owens Corning Foamular. I opted for one 4 x 8 foot sheet rather than two for the time being. I can always add another one later if I need it. The Woodworker made a frame for the back that was glued in place for stability and for hanging. The frame is the size of the sheet of Foamular. Two cross members help to secure the frame and add more stability. Note how the print on the Foamular is at the BACK of the sheet, not the front. That is important! We purchased Warm & White cotton batting to wrap around the Foamular, making sure we had enough to wrap to the back and staple. 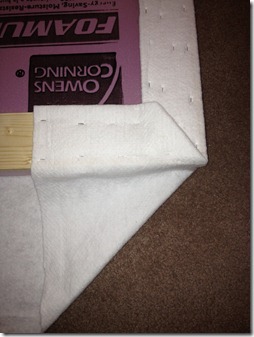 The cotton batting was wrapped around to the back and DOUBLED over prior to being stapled with a staple gun. I let the Woodworker handle the staple gun because he is, after all, a professional. I showed my professional woodworker how to miter the corners, and he did a wonderful job. Two hooks were screwed into beams along the rafters above the basement wall in my sewing area. Two hooks were screwed into the wooden board across the top of my design wall. 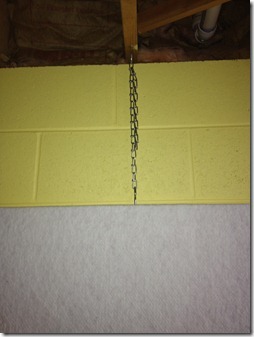 A chain was used to suspend the design wall from the rafters. See? It works perfectly! Some day soon you’ll see my fantastic design wall strutting it’s stuff with actual quilt fabrics arranged in a pleasing fashion. If you leave a comment below, please tell the Woodworker how appreciative of him you are. You can find him during the day at Mosey’s Woodworks in beautiful downtown Flushing. Ah you're so clever – I used a foam board too, no frame, just nailed right into the drywall. It really makes a huge difference, having that space to play on, doesn't it? My son sent me a large flannel sheet for Christmas but I have no space large enough to hang it inside our rabbit hutch. O might borrow the chain-link fence in the park and then roll it up with pieces in place. Hmmmm. What a brilliant idea! That would work for an apartment as well — I think it could be hung with picture hooks? I'm showing this to my DH as I think it would be a great way to finally get a design wall of sorts! I long for a design wall, too. Maybe some day it will become a reality! You are so lucky! The Woodworker did a splendid job!